Reaching 32+5 weeks means we are down to single figures with less than 8 weeks to go. 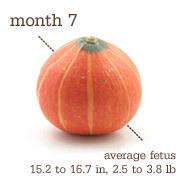 The baby is the size of a squash (or a jicama, whatever that is). As you can see my bump is still growing a lot! 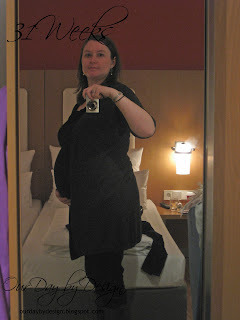 I can still get away with wearing a few normal tops or vests providing they are long enough, otherwise its all maternity clothes. Although I think my bump is quite big I've been told by more than one person this week that they don't think so at all, and since its all out the front it doesn't look too big; one was surprised that I only had 8 weeks to go! Unsurprisingly I haven't managed to take a photo every week since my last update although I did manage one in Cologne at 31 weeks and one on Sunday when I was exactly 32 weeks. It was my 30th birthday on Saturday so after having a delicious afternoon tea at Mimi's in Edinburgh, my parents had some family and friends round to their house on Sunday for another homemade afternoon tea to celebrate. 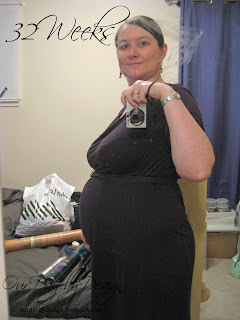 Its not quite how I imagined my 30th to be, 32 weeks pregnant, but I will make up for it once the baby arrives! We have been quite busy the last few weeks clearing out the spare room, especially the wardrobe, ready for it to be transformed into the nursery and have some space for things for the baby; we also painted the room white and glossed all the woodwork. I say we but I really mean Graham. The cot and car seat are getting delivered this weekend so we are going to paint the grey stripes on the wall on Saturday, lets hope it goes well! We also spent the last weekend in November in Cologne for a long weekend, to see the Christmas markets, celebrate my birthday early and enjoy our last holiday with just the two of us; a full recap will come at some point but the city was fantastic. The weekend before I had also enjoyed Christmas in November with the blogging six girls. My antenatal classes have now finished, the last one was on Wednesday. At my previous midwife appointment four weeks ago, I was measuring exactly 28cm and I got my anti-D injection as well as my flu jab and yet more blood taken. I had an appointment to see the neurologist at the hospital, as my mum had a blood clot in her lung in 2008 and they wanted to see me. Although my blood screening was clear, they still want me to take blood thinning injections for 6 weeks as soon as I've given birth which should be interesting. I saw the midwife again yesterday and everything was good, although I'm now only measuring 31cm instead of 32, which isn't a problem at this point. We have NCT antenatal classes starting next week, which Graham is able to come to as they are all in the evenings with one at the weekend. There have been lots of babies arriving too; Grahams cousin had a baby girl Amy, who we got to see when she had just gotten home at 4 days old. Three of my friends have also had their babies in the last month, two with girls and one boy. One of Grahams friends wife's in due in the middle of December then my sister is due at Christmas. Once we have painted the nursery stripes this weekend, we also want to make up the cot and maybe go and buy the other furniture we want on Sunday, as well as visiting my friend and their new baby. Our pram arrived at my parents last weekend although its still in its box just now until we get a chance to make it up! Next weekend we are having a Christmas dinner celebration with my parents at Norton House (the hotel we had our wedding reception in) since they are going to spend Christmas in Australia with my sister and her family. Between Christmas and new year I'm also hoping to go to the spa there to get myself a pregnancy massage with some of the money I received for my birthday. In other news, I also won my very first giveaway this week. 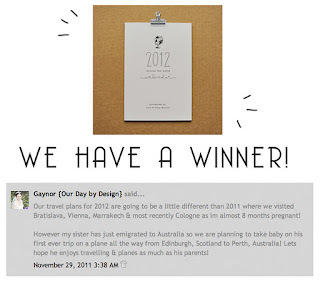 I entered to win a 2012 Around the World Calendar from Mr & Mrs Globetrot. All you had to do was leave a comment letting them know one trip you are planning to take in 2012. I told them that our travel plans in 2012 would be a little different from 2011 but that we were planning a trip to Australia next year with the baby to visit my sister and family. It was announced on the 1st that I had won and I'm looking forward to receiving the calendar of their gorgeous photos. What a happy birthday! I hope you have a wonderful Christmas and the little one will be here before you know it! 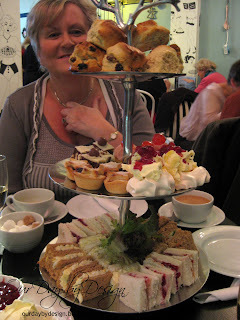 Think I might need to try the afternoon tea at mimi's next time. Looks scrummy.